After the victory of the August General Uprising, on September 2nd 1945, President Ho Chi Minh, on behalf the Vietnamese people, read the Declaration of Independence officially proclaiming to the world the birth of the Democratic Republic of Vietnam - the first worker-peasant State in Southeast Asia. That remarkable event ushered in a new era for Vietnam - the era of independence and socialism. Thereafter, our people would have enjoyed the right to live in peace, independence and freedom to build and develop our country. However, that right had not been realized as the French Colonialists managed to invade our country once again. Supported by the British and US imperialists, the French Colonialists unilaterally wriggled out of their commitments, breaking the Franco-Vietnam Agreement of March 6th, 1946 and the Franco-Vietnam Modus Vivendi of September 14th, 1946, stepping up their military activities to spoil our peace. As anticipated by the Standing Central Party Committee at the first National Military Conference (held on October 19th, 1946) that “Sooner or later, the French will attack us and we absolutely have to conduct a resistance war against them”. November 1946, the French troops provoked and engaged us in Hai Phong. Early December 1946, they occupied Da Nang and Lang Son. On December 17th, 1946, they provoked us in the Capital City of Hanoi. Notably, on December 18th, 1946, commander of the French troops sent us an ultimatum requiring the Government of the Democratic Republic of Vietnam to disarm its self-defence forces and hand over the control of Hanoi to them within 48 hours. With the aspirations for peace and national independence, our Party, President Ho Chi Minh and the Government of the Democratic Republic of Vietnam restrained to the utmost and tried to negotiate with the French Government, but in vain. “The more concessions we make, the more the French colonialists use them to encroach upon our rights. They are determined to invade our country once again”. To protect our newly-gained independence, on December 19th 1946, President Ho Chi Minh issued the “Appeal for National Resistance”, clearly stating: “All of you, men and women, young and old, what ever your region, ethnic origin, or political opinion, arise to struggle against French colonialism and save the Homeland. Let those who have guns use their guns, those who have swords use their swords, those have neither guns nor swords use hoes, pick-axes, and sticks. Let all arise to oppose colonialism and defend our Homeland”. Previously, on December 12th, 1946, the Standing Central Party Committee issued the Directive on “Resistance War of All People” to fight the French Colonialists. On early days of the national resistance war against the French Colonialists, the balance of economic and military advantage lies with the enemy; however, we were in advantage of political and spiritual power, and of the creative and correct people’s war led by the Party and President Ho Chi Minh. The People’s Armed Forces, particularly the People’s Army, were built and trained into increasingly mature and strong ones and became the foundation for the all people’s war. Thus, during the resistance war, the military balance was gradually shifted to our advantage. The more we fought, the more victories we won to gain the strategic initiative. Meanwhile, the enemy suffered more increasingly heavier defeats and fell into passive position. In the final phase of the resistance war, generally, we were stronger than the enemy. Therefore, it could be said that our victory and the enemy’s defeat decided by the strategic battle of Dien Bien Phu were historically inevitable. That victory forced the French Colonialists and the U.S. to sign the Geneva Accords ending the war and restoring peace in Indochina. 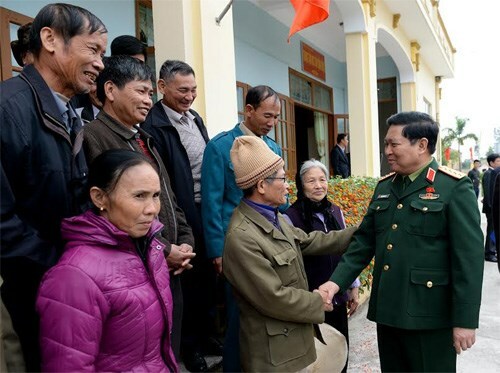 The success of the struggle for national liberation was the result of various elements of which the sound and clear-sighted leadership of the Party and President Ho Chi Minh was the fundamental and decisive one. During the resistance war against the French Colonialists, our Party brought into play at highest level our whole nation’s patriotic tradition, the strong will “We'd rather sacrifice everything than lose the country and be enslaved”, the spirit of “Sacrificing lives to save the Homeland” and “”Sacrificing the last drop of blood to safeguard the country”, aroused and promoted the strength of all people’s great solidarity, combined the strength of the nation and that of the times to create the synergy of the all people’s war to win step-by-step victories and advance towards the comprehensive victory. In the years to come, peace, cooperation and development will be the main trend; however, the regional and global situation will still be complex and unpredictable. Disputes over national sovereignty, seas and islands, ethnic and religious conflicts, military interventions, conversions, terrorist attacks, local and cyber warfare continue to take place and be severe in many regions. Major powers will make strategic adjustments, cooperating and compromising with one another while competing with and containing one another. It will significantly impact on the world order. As for our country, the hostile forces continue to accelerate their acts of sabotage through the “Peaceful Evolution” Strategy, “self-evolution” and “self-transformation”. Thus, our military and people’s task of protecting the Homeland will witness new developments with a mixture of opportunities, advantages, challenges and difficulties, requiring us higher standards. First, bringing into play the synergy of the whole nation and the support of the international community, building a strong, comprehensive, independent, self-reliant, and increasingly modern all-people national defence. Solidarity is a valuable tradition and a source of strength of our nation. Reality has proved that if a nation, no matter how small it is, knows how to unite and bring into play the strength of all people, it will defeat all invaders even when they enjoy advantages in economic and military aspects. Fully aware of the important role of all people in the revolutionary cause, our Party led by President Ho Chi Minh has always attached great importance to building up and bringing into play the highest- level strength of the national solidarity bloc. The central idea of the Appeal for National Resistance of President Ho Chi Minh and the Directive on Resistance War of All People made by the Central Party Committee was uniting within the whole nation, resolutely fighting to save the Homeland with the spirit “We would rather sacrifice everything than lose the country and be enslaved”. That was the precondition for setting out our Party’s guideline “An all-people, all-around, protracted, mainly self-reliant resistance war” to fight against the French Colonialists. Promoting that spirit, we should attach great importance to strengthening the national solidarity bloc to create the synergy in the cause of strengthening the national defence and protecting the Homeland. Second, strengthening the potential of the all-people national defence, particularly its political and spiritual potential to firmly safeguard the national independence, sovereignty, unification and territorial integrity, maintaining peace and stability to build and develop the country. The struggle for national liberation showed the importance of the political and spiritual factor. That is also our absolute advantage over the enemy. In spite of the fact that we were weaker than them in force, weapons and equipment, we were, generally, stronger than them in political and spiritual factor. During the resistance war, our Party and President Ho Chi Minh aroused and brought into play at highest level this factor, particularly the patriotic tradition, the strong will to fight the enemy and the faith in a victory of the whole nation for the sake of national independence, freedom, and the people’s happiness. That created a great source of strength for the whole nation to defeat the French Colonialists’ invasion. Third, focusing on building an all-people national defence which is strong in both posture and force; associating the building of all-people national defence posture with that of people’s security posture regionally and nationwide. The power of the all-people national defence depends on many elements, in which posture and force play the vital role. Building strong posture and force for the national defence is both the goal and the main content of the task of building all-people national defence in the new situation. During the implementation of the task, it is necessary to associate the building of all-people national defence posture with that of people’s security posture regionally and nationwide as identified in the 12th National Party Congress: “Strengthening defence and security potential, building strong all-people national defence posture and people’s security posture”. In this regard, it is important to focus on “Building people’s heart and mind posture to provide a solid foundation for building the all-people national defence and people’s security”. First and foremost, it is necessary to focus on building pure and strong political systems at levels, enhancing the people’s confidence in the Party, the State and the regime, arousing and promoting the political and spiritual factor among people from all walks of life, building up the national solidarity bloc to generate support for the Party’s guidelines and the State’s policy and law on building the all-people national defence posture. Fourth, continue building revolutionary, regular, seasoned, gradually modern People’s Army with high-level synergy and combat strength, meeting the requirements set by the task of protecting the Homeland. In the cause of national protection today, it is necessary to continue to build the three-level armed forces (including regular forces, irregular forces, and militia and self-defence forces) as the core to build a strong all-people national defence and protect the Homeland. In this regard, we should focus on building revolutionary, regular, seasoned, gradually modern People’s Army with several forces moved straight to modernity to ensure the Army’s high-level synergy and combat strength. We should attach great importance to building politically, ideologically and organizationally strong Army, ensuring that the Army be a really loyal, credible political and combat force of the Party, the State and the people. Party committees and commanders at levels should seriously follow the leadership and direction of the Central Military Commission and the Ministry of National Defence over the Army’s force organization until 2020 and beyond. The process of adjusting force organization and structure must satisfy the requirements “seasoned, lean, strong, flexible”, ensuring a proper proportion between services and arms, organs and units, combat forces and support forces, and full strength for units moving straight to modernity as well as combat readiness units stationed in borders, seas and islands. The 70th National Resistance Day Anniversary, the 72nd Vietnam People’s Army Founding Anniversary and the 27th All-People National Defence Festive Day Anniversary are significant historical events of the country and the Army. Though they are further down to the past, lessons of bringing into play the solidarity and the strong will to fight for national independence and freedom during the National Resistance War, of building the Army and the All-People National Defence Festive Day remain valuable. Promoting the spirit of national resistance, we should thoroughly grasp and successfully implement the Resolution of the 12th National Party Congress, particularly the viewpoints, guidelines ad measures to build the all-people national defence in the new situation, making contributions to strengthening defence potential, firmly protecting national independence, sovereignty, unification and territorial integrity, maintaining peace and stability to build and develop the country.